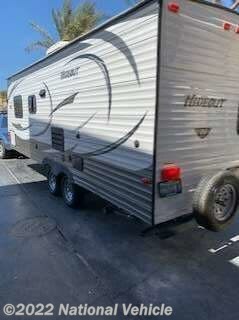 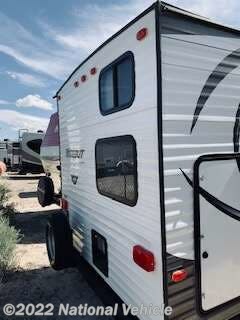 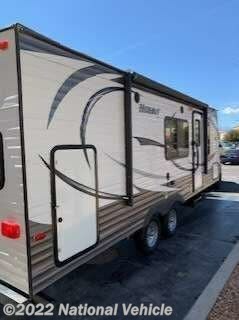 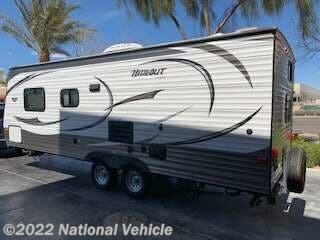 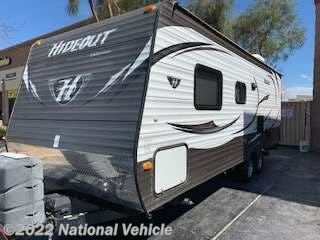 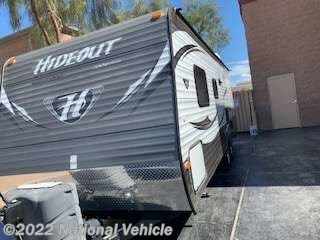 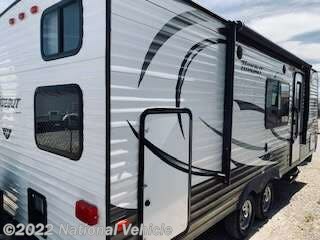 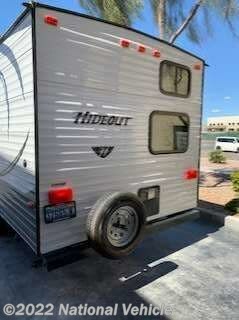 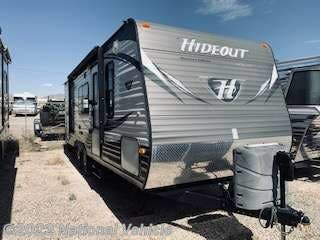 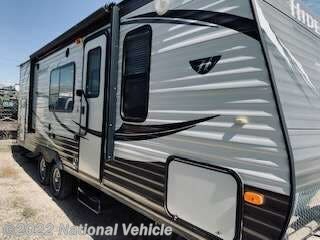 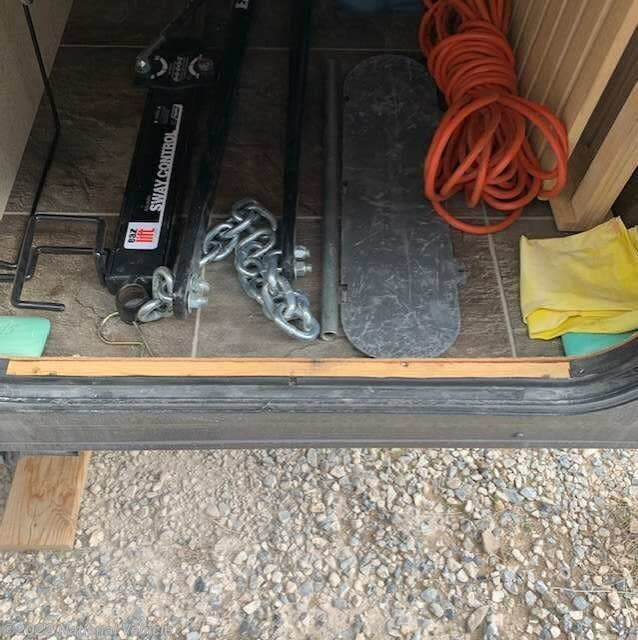 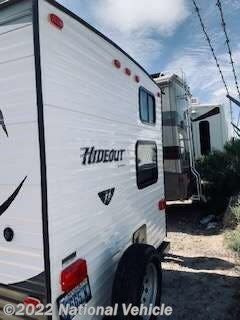 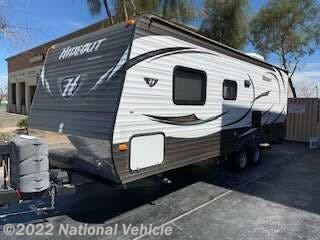 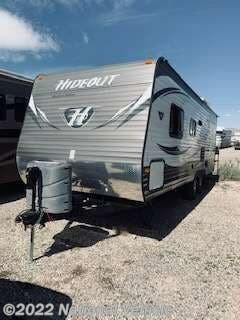 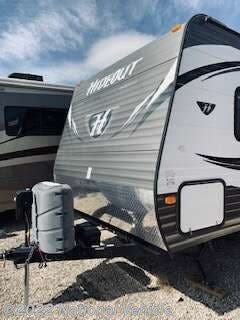 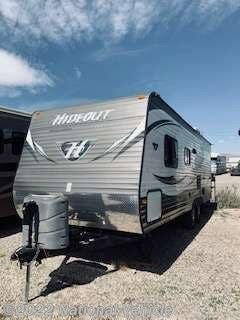 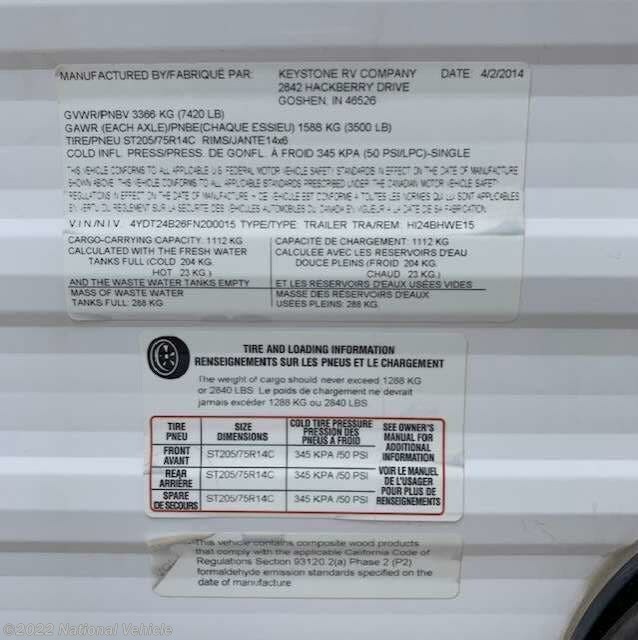 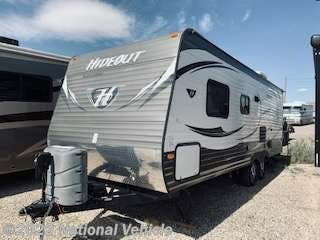 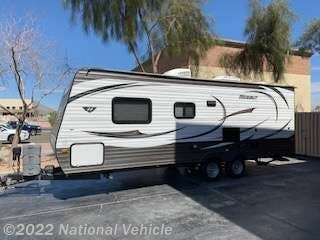 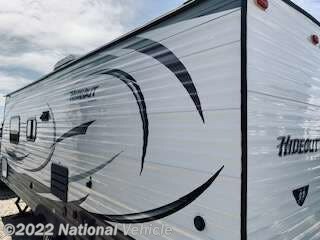 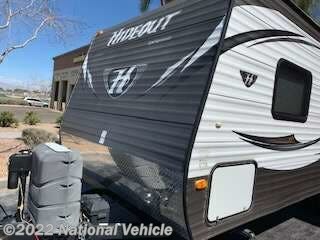 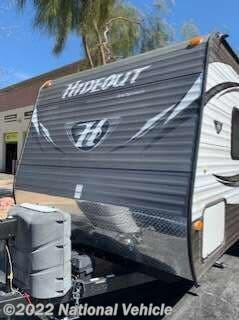 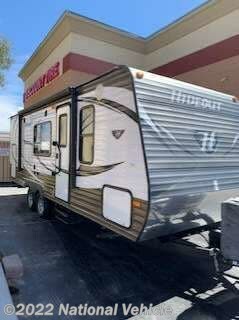 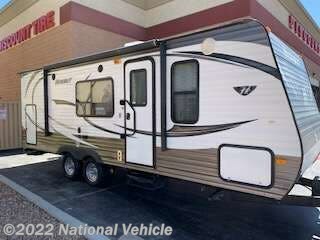 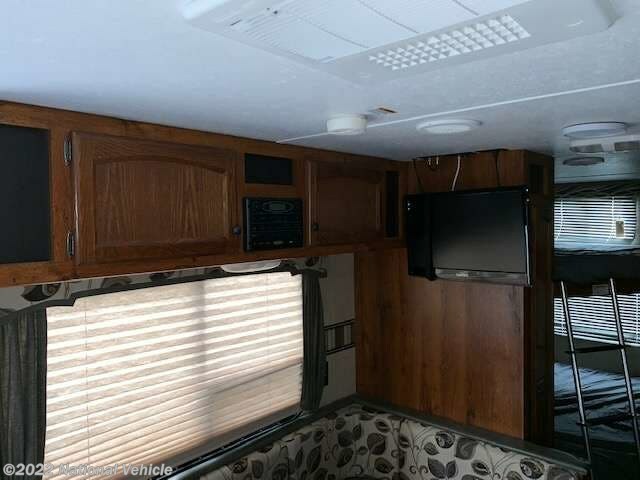 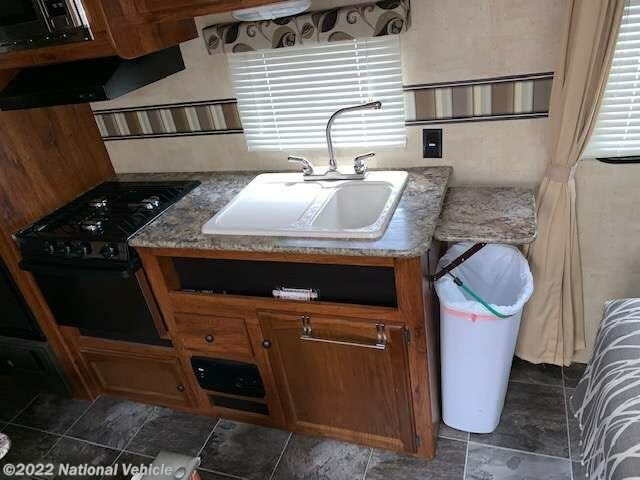 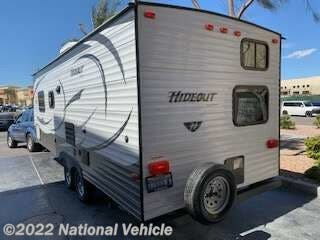 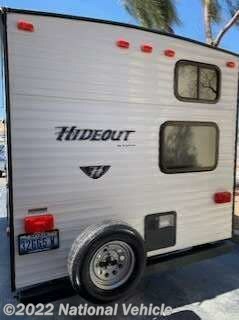 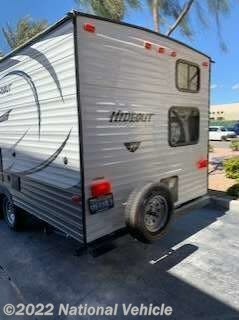 2015 Keystone Hideout 24BHWE 26' Travel Trailer. 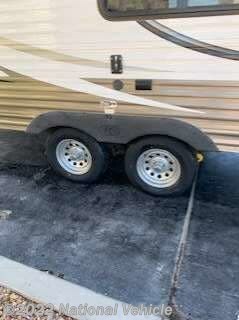 Patio Awning, Sleeps 8, A/C Unit, Stabilizing Jacks. 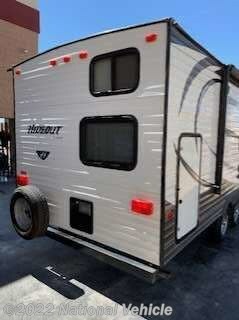 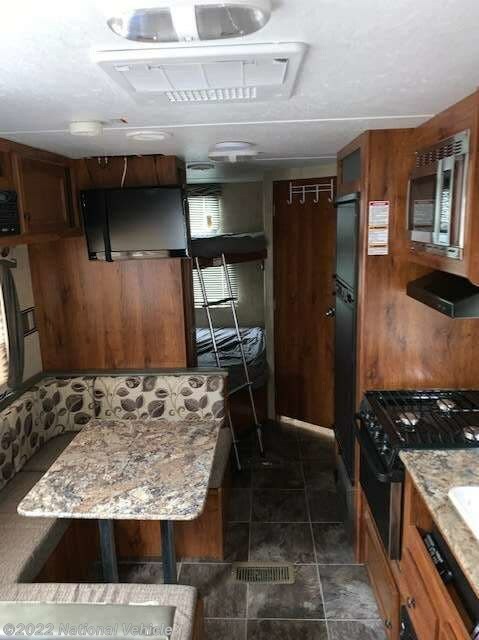 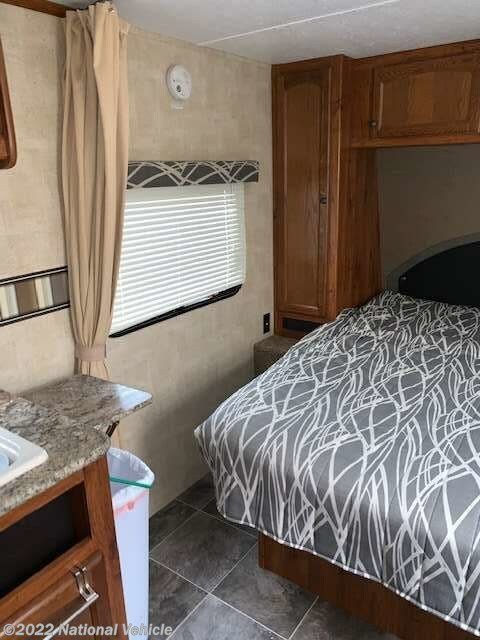 This Hideout bunkhouse travel trailer model 24BHWE features a rear bath layout, a set of bunks, and more. 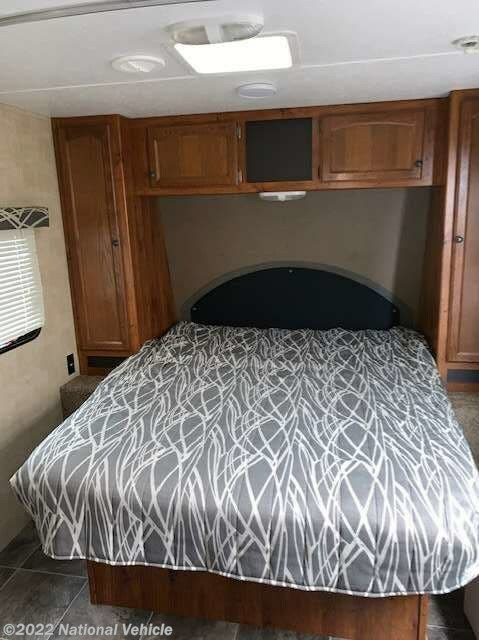 As you enter notice the front queen bed with shirt closets on both sides, plus overhead storage too. 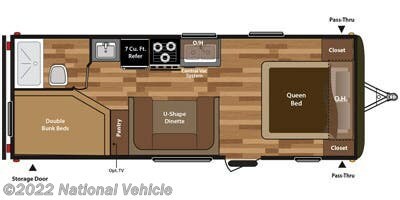 To the left of the door find a u-shaped dinette for ample seating, plus there is a pantry for dry good storage and more. 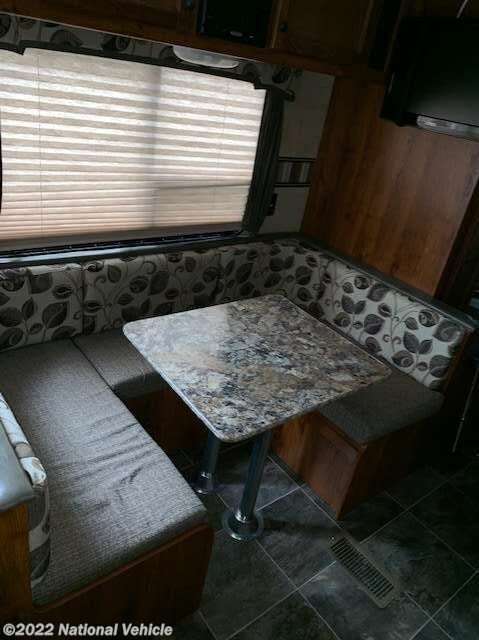 The dinette transforms to provide extra sleeping space. 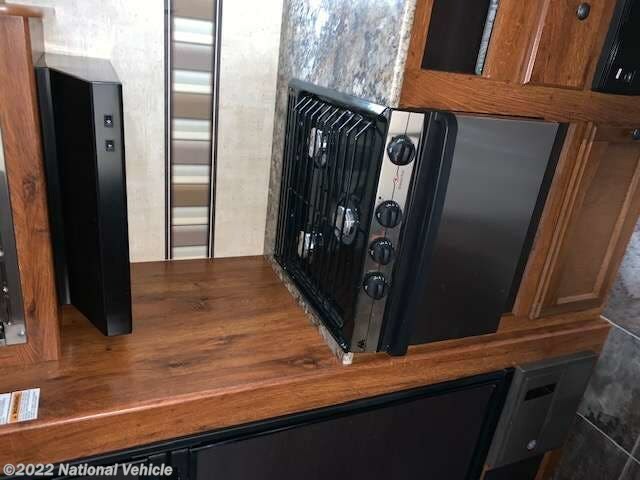 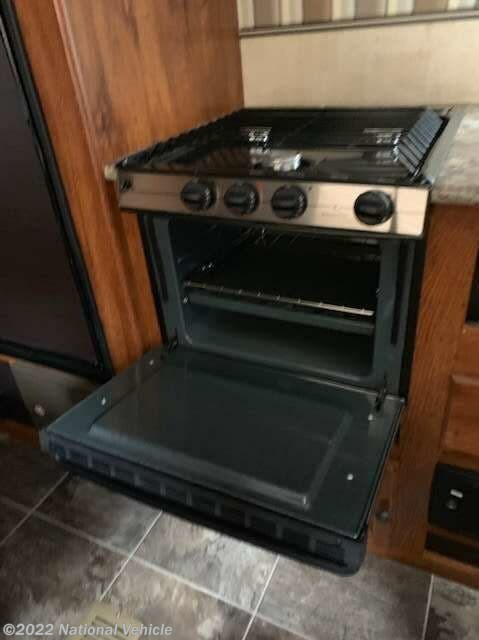 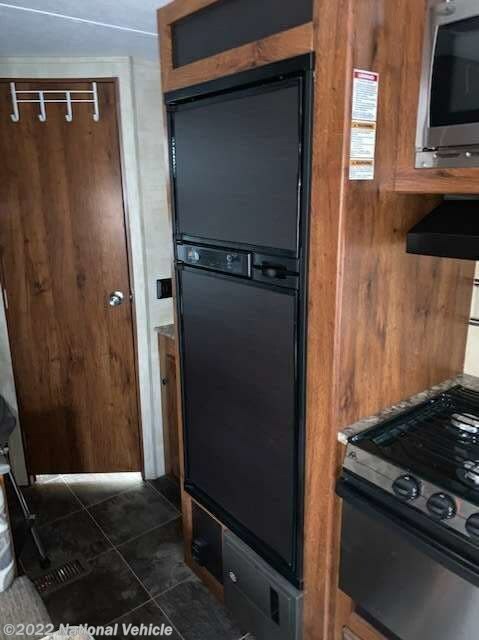 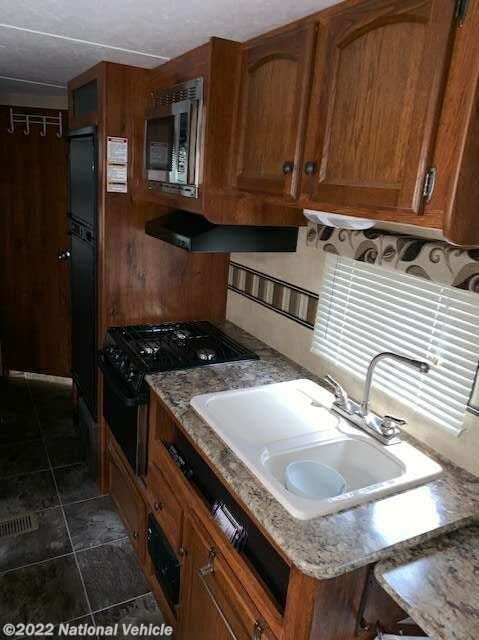 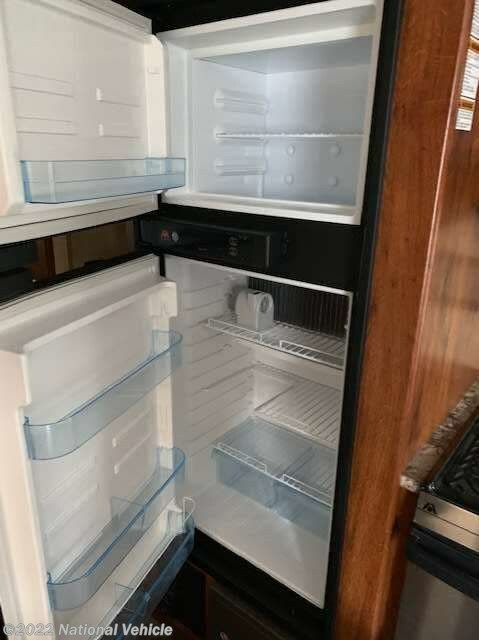 The kitchen appliances are opposite the dinette and feature a refrigerator, three burner range, stove, Microwave combination, plus double kitchen sinks and overhead storage. 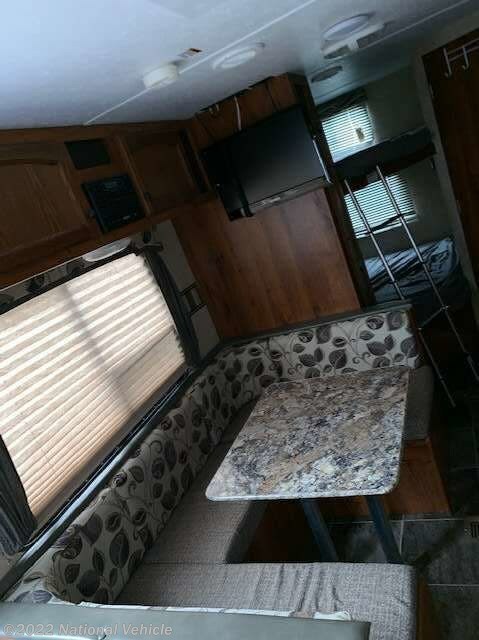 The rear left corner offers a 52" x 74" bed with angled inside corner and 32" x 74" bunk above. 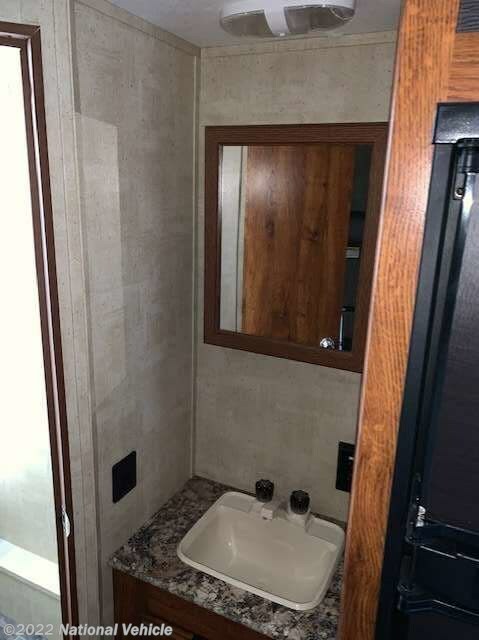 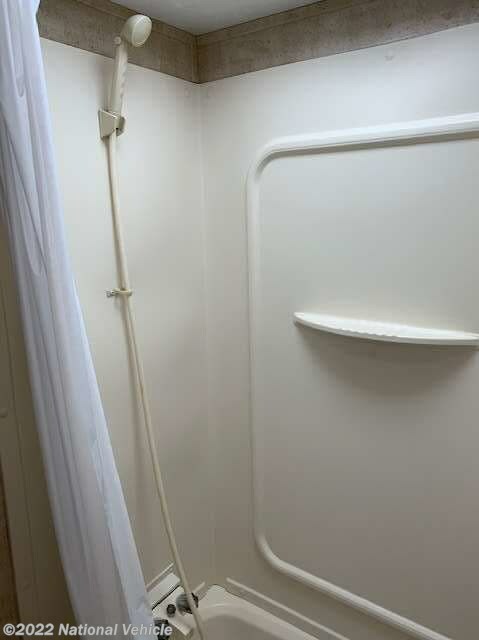 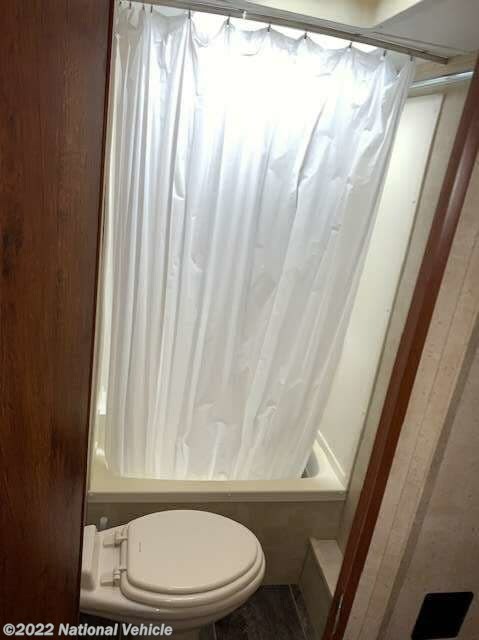 The opposite corner provides a tub/shower and toilet, with a separate sink just outside the door and so much more! 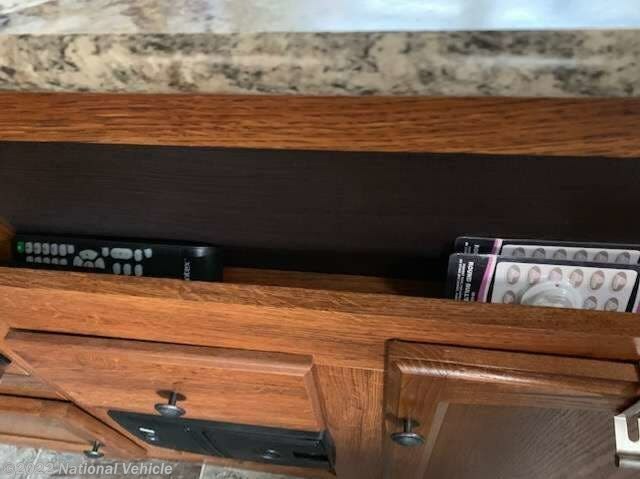 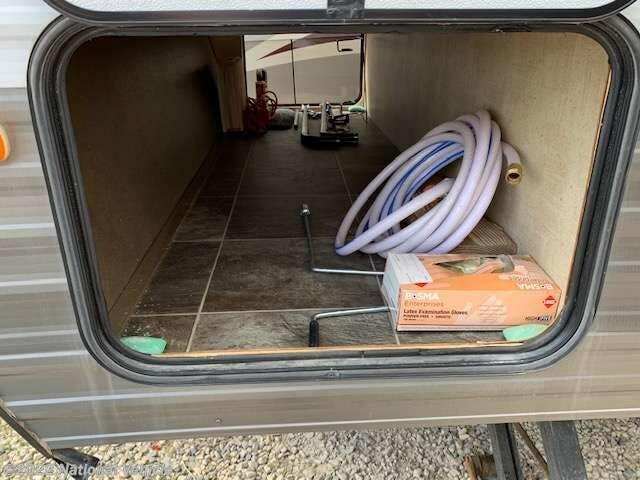 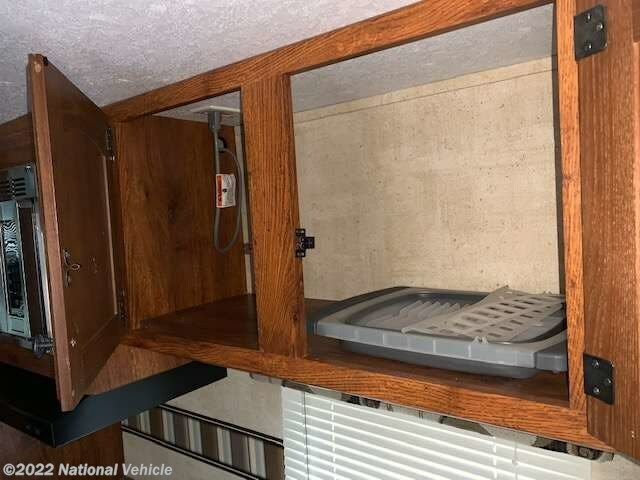 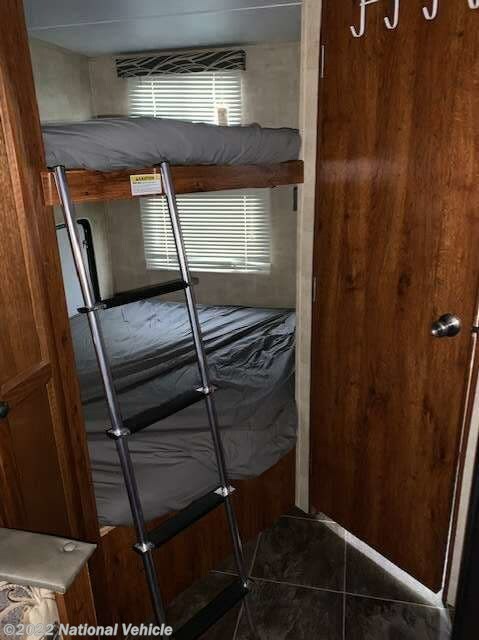 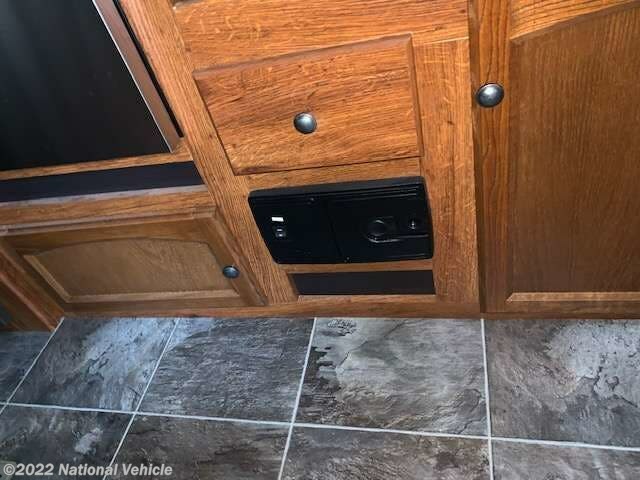 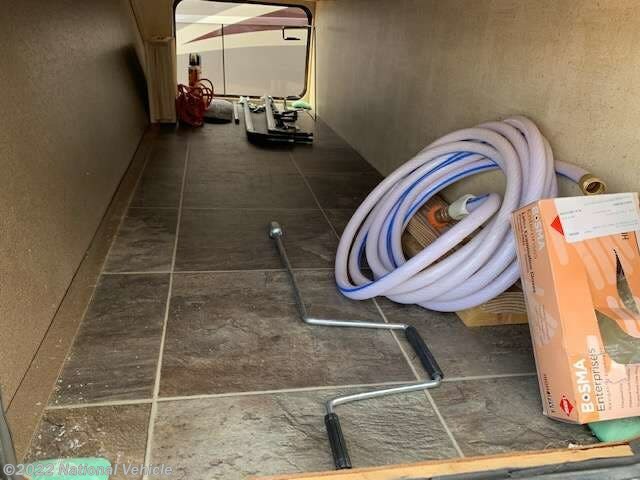 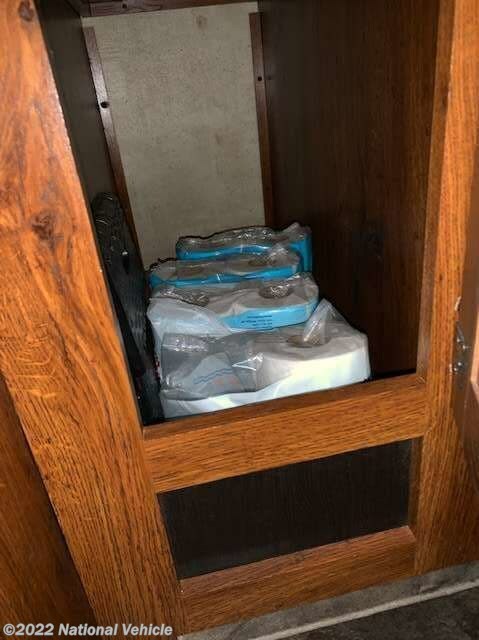 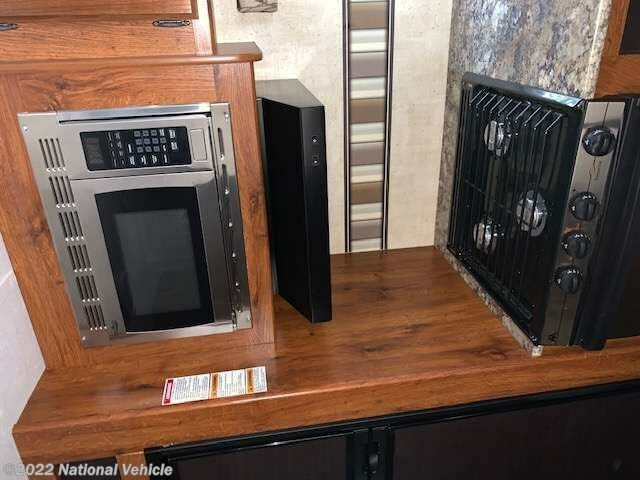 You will also enjoy the front pass-through storage compartment and rear storage door beneath the bunk bed to stow away all of your camping gear! 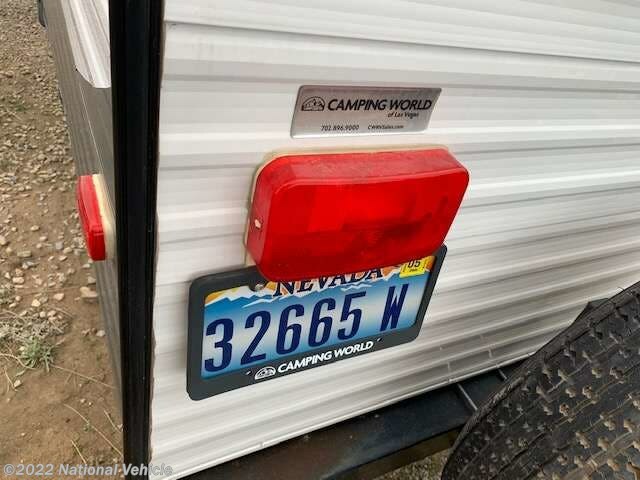 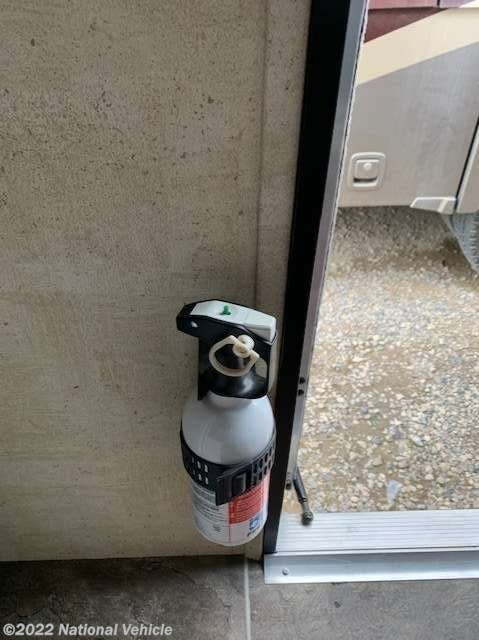 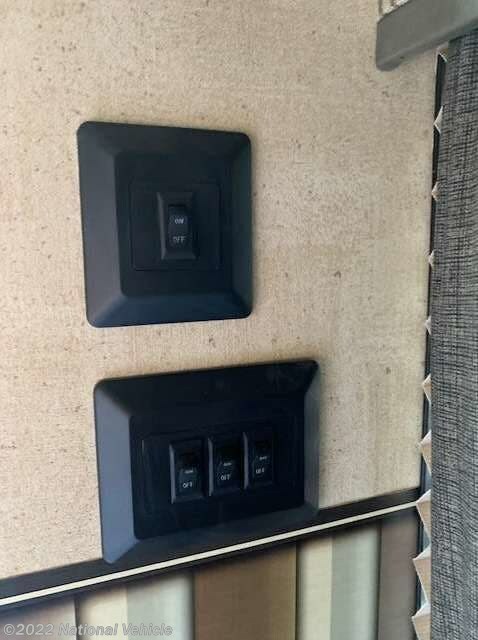 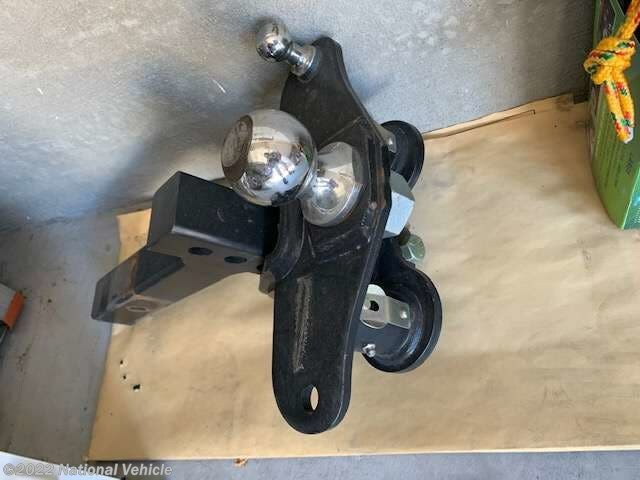 •Hitch to car Hitch connector. 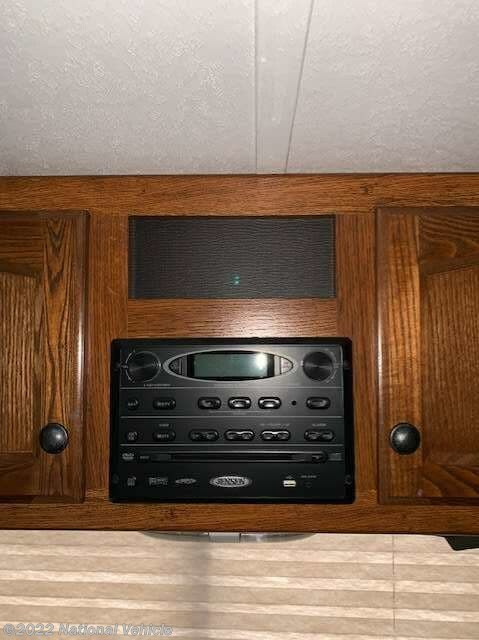 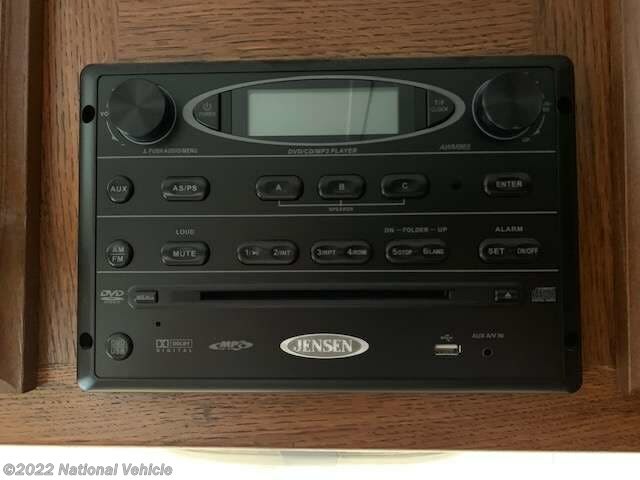 •Inside Internal Radio-that also plays outside speakers. 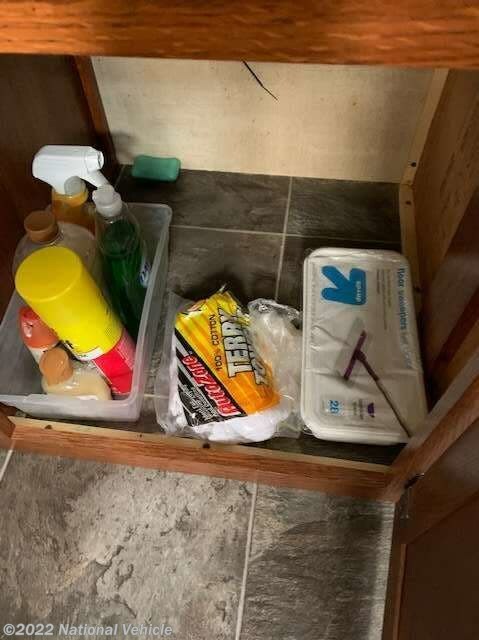 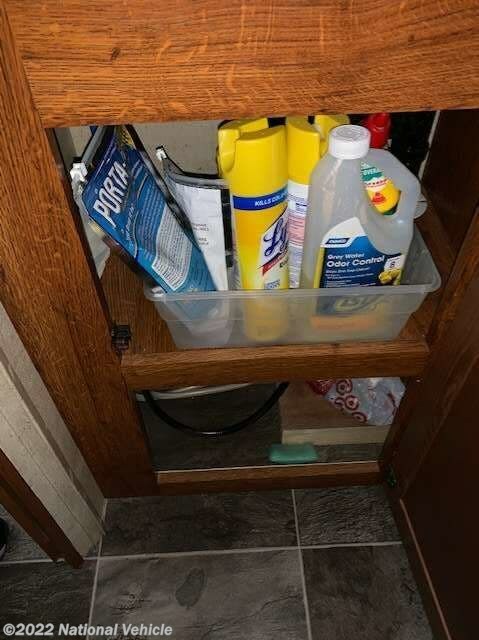 •Chemicals, cleaners and all cleaning supplies. 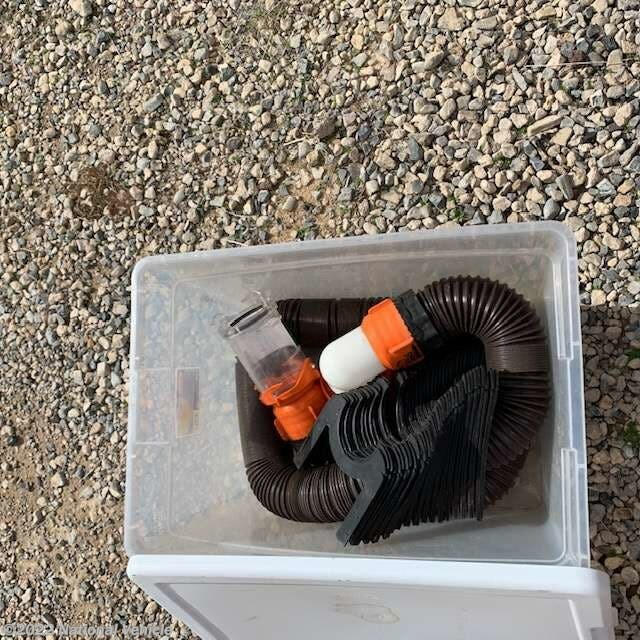 •Drill for any use, with 3/4" connector for leveling jacks. 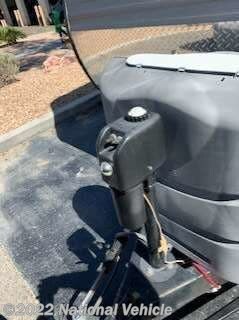 •3/4" Manual crank socket for leveling jacks. 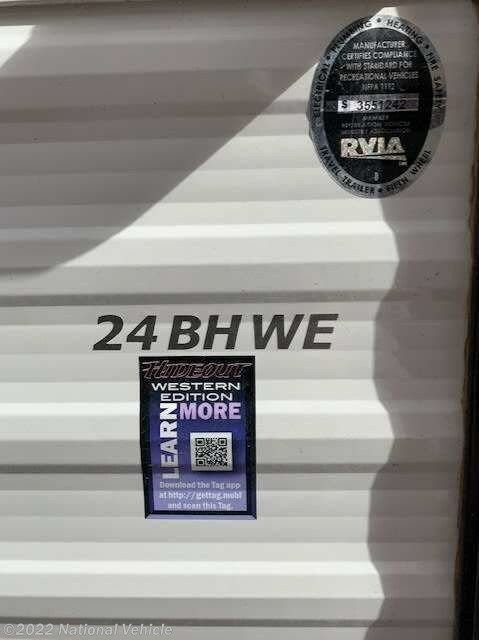 ***lots more in the trailer. 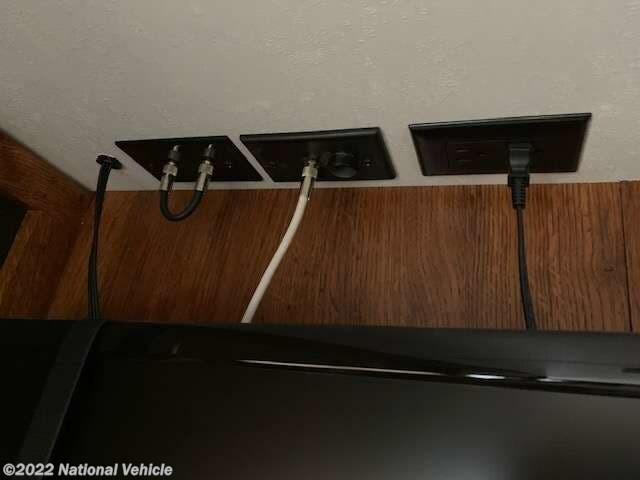 •Many connections for TV and coax cable. 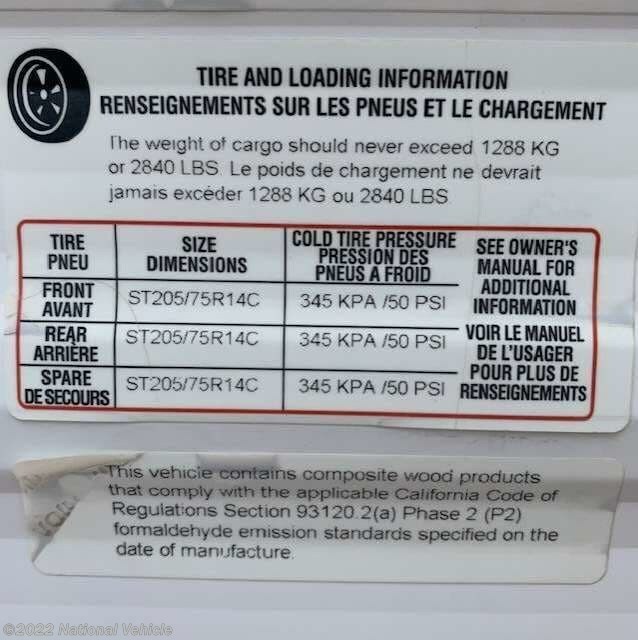 •Brand New Tires, Just Replaced! 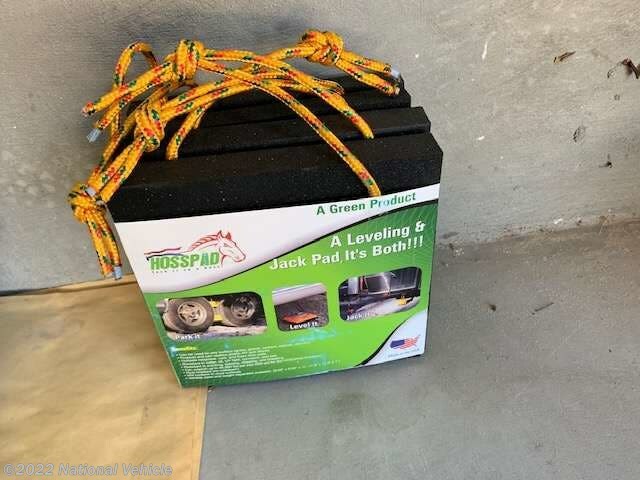 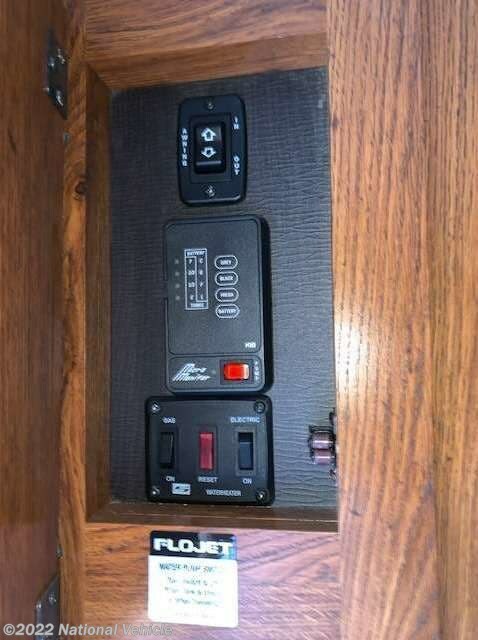 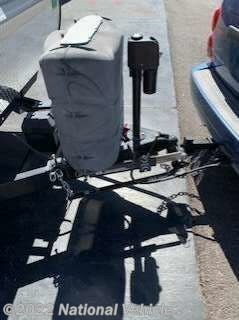 •Electrical/Auto tongue jack and Auto awning. 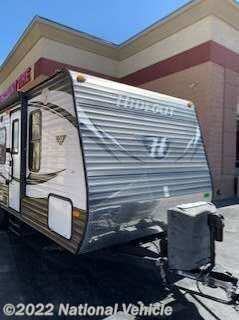 *This 2015 Keystone Hideout is located in Las Vegas, Nevada. 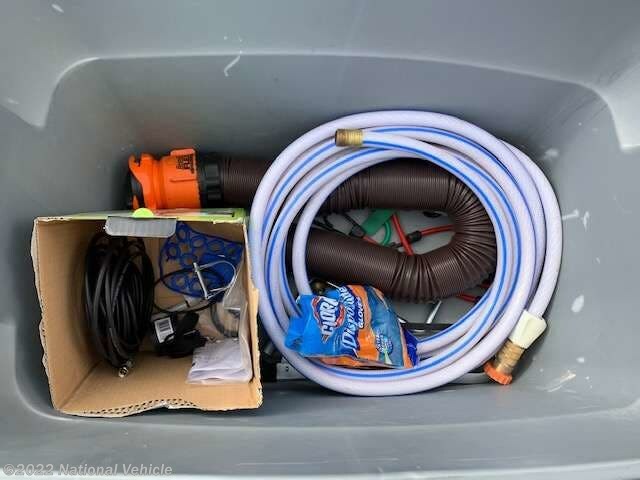  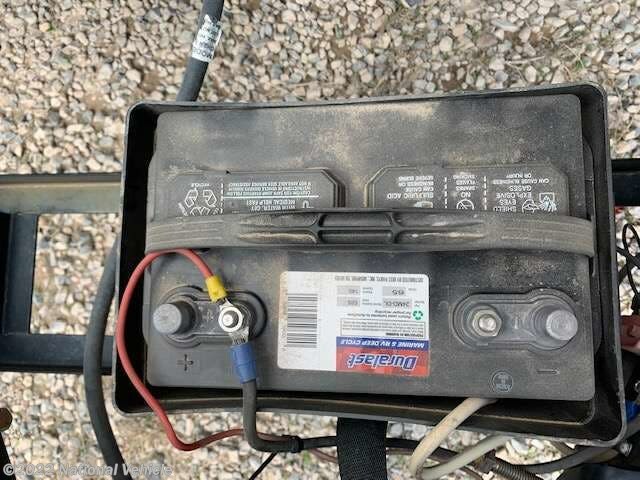 Please call 1-800-320-9557 and mention listing id: 137237. 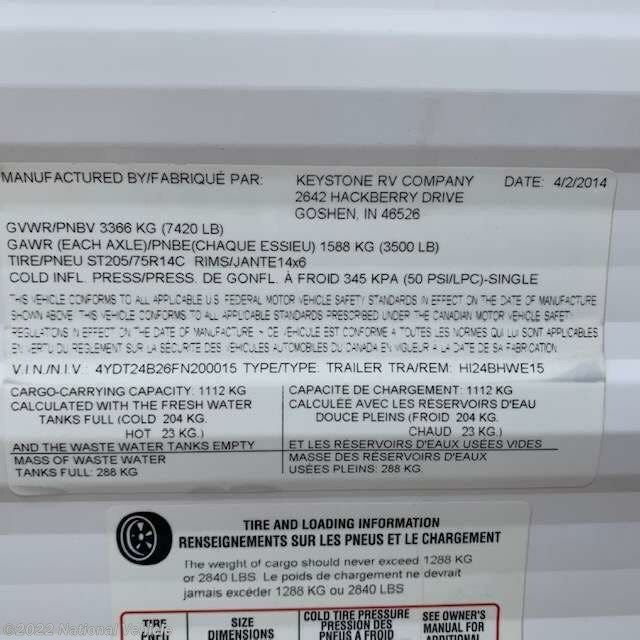 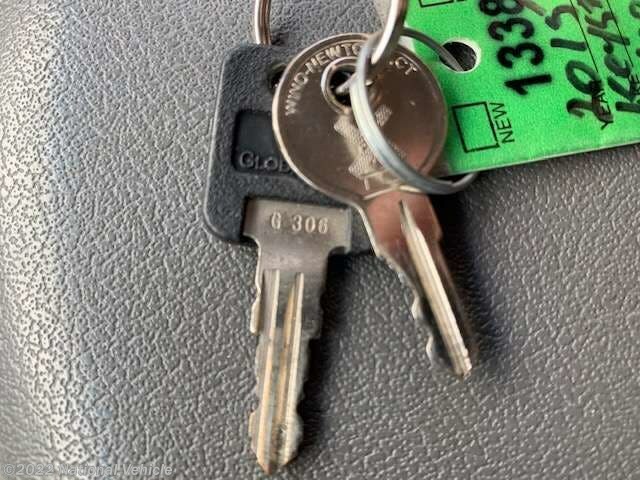 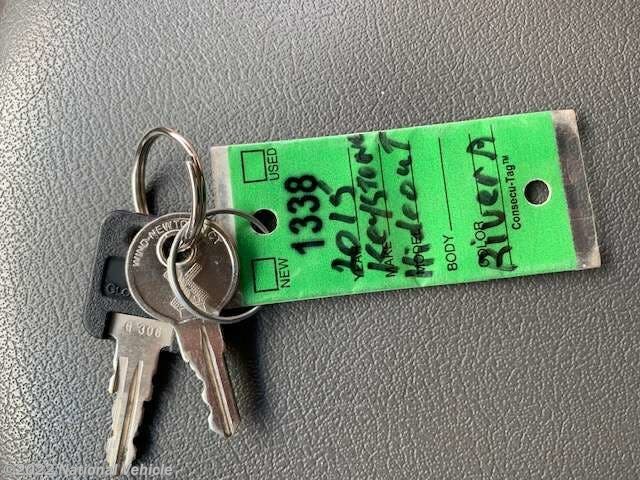 Check out Stock # c549514 - 2015 Keystone Hideout 24BHWE on keystonervsource.com!